Correctly installing a CFValve™ makes pumping with a knapsack sprayer easy. Fewer strokes and less physical effort are necessary to effectively apply chemicals. There is no need to pump too hard or too quickly; only one or two strokes of the pump will be necessary to commence spraying. From that point, one or two strokes for every few steps will maintain a constant flow at the correct pressure. 1. Unscrew nozzle. Check the screen to make certain it is clean. Replace the screen. 2. Install the CFValve™ with screen firmly in place. 3. 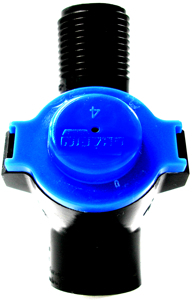 Screw the nozzle onto the CFValve™. Note: Some knapsacks have an adjustable pressure relief valve in the tank. If there is one on the equipment in use, please make sure that the setting is on the high mark. 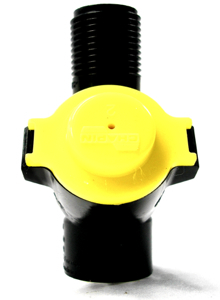 This allows the CFValve™ to store the high pressure and eliminates any unnecessary pumping action. Cleaning: Always flush equipment with clean water after each use. Leave the CFValve™ in place on the wand to flush the knapsack and CFValve™. Do not store equipment with pressure in the system. To release the pressure at the valve: After flushing, stop the pumping and/or close the trigger. Unscrew the CFValve™ take it off. Then open the trigger to empty the system. 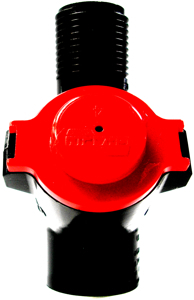 Replace the CFValve™ to make ready for the next application. Bullet points in this box.